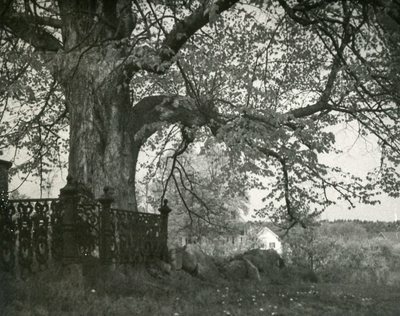 An image scanned from a black and white photograph taken in 1949 of a wrought iron gate fence and an exceptionally large tree in the background. The caption simply says, "Phippsburg." The wrought iron pattern seems to match what appears in other photographs taken at the Phippsburg Congregational Church, United Church of Christ at 10 Church Lane.